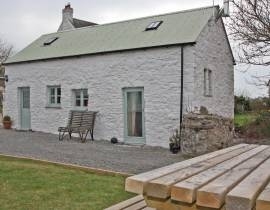 On a headland above the quaint fishing village of Little Haven, just one mile from the sea, lies The Dairy; recently and sympathetically converted into a detached, stone cottage brimming with character. Adorned with original art works and handcrafted fabrics, its lovely ambience is enhanced further by its double height, vaulted ceiling creating not only a wonderful sense of space but allowing light to flood through velux windows into the healthy habitat below: Lime render allows The Dairy’s thick old stone walls to breathe, while fresh, chemical-free, filtered spring water flows through its taps. A large glazed door from the living area, connects inside with out, offering not only pleasant views across the lawned garden but access to the gravelled patio area – the ideal spot for al fresco dining. While inside, beamed ceilings, the wood-burning stove and a host of comfortable soft furnishings provide the perfect ingredients for irresistibly cosy evenings. Glimpsed through the trees and hedgerows as you roam the owners’ land, the sea lies tantalizingly close. Just a mile of meandering through a peaceful country lane and onto the Pembrokeshire Coast Path, allows you to discover Mill Haven Beach; perfect for exploring rock pools. Why not opt into the Coastal Foraging course (offered, amongst other courses, by the owners of Mill Haven Place) and learn what’s nutritious and delicious along the sea shore. Little Haven, just a mile and a half away, serves other gastronomic delights from its tea-rooms, cafes, pubs and restaurants. The Swan, with splendid views across the small, sandy bay offers a great menu created from the abundant array of Pembrokeshire produce and the perfect place to witness the madness of the New Years Day swim or the mayhem of the August raft race. The Dairy at Mill Haven Place can be booked individually or together with The Barn at Mill Haven Place to accommodate the gathering of family and friends. Shared use of large lawned area to the front. Patio area with garden dining furniture and BBQ. Off road parking for 3+ cars. The filtered spring water is certified annually. Courses in Coastal Foraging, Bush Craft and Art taught by the owners for a small fee. The three acre site of Mill Haven Place consists of two homes belonging to the owners, The Barn (a 3 bed holiday cottage sleeping 6 - 8) and a camp site for a few Yurts (glam camping!) and a few pitches available for members of the Camping and Caravanning Club only. This is a large site and affords plenty of privacy.